Finnex Planted+ 24/7 V2 (Finnex 24/7 CC series) is a new update version of the old Finnex Planted+ 24/7 Fully Automated. 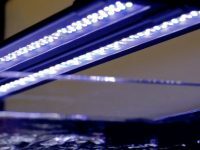 It is one of the best LED light for planted tanks that excellently promotes the healthy growth of aquarium plants. 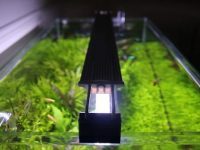 Working more than normal fish tank LED lights with only turning on/off modes, it comes with a smart timer for free hand control, high output LED lamp for growing most types of aquatic plants, and customizable color effects for the stunning view. This review aims to help you get the proper understanding of this LED light as well as how to use it. How to program 24/7 feature? The Finnex Planted+ 24/7 v2 is designed to take care of most types of plants in your aquarium. To facilitate proper light provision, the fixture is fitted with powerful LED bulbs which have the capacity to deliver 7000K daytime light. This light is beneficial just like natural sunlight as it allows aquarium plants to photosynthesize normally. The light is equipped with high quality LED bulbs which are able to last over 40000 hours. These LED bulbs includes true 660nm red LEDs which are proven to be one of the best wavelengths for the photosynthesis of aquatic plants. With an LED spread of 120 degrees, the light is able to lighten up your entire aquarium to support the plant growth, even in corner areas. Based on the previous table, I recommend the light for most types of planted aquariums. If you have high light plants, ensure to place them directly under the light and in nearby regions with PAR above 50 to simulate the best growth. 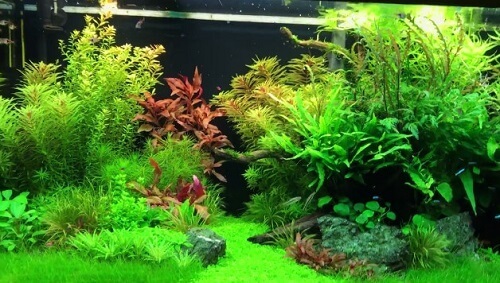 Plants in your aquarium need only 8-10 hours of lighting a day for photosynthesis. Over lighting is not only NOT beneficial but also harmful to your fish and plants. That is the reason why you need to turn on and off the aquarium light every day to ensure the health of your aquarium livestock. Luckily, you don’t have to turn on/off the aquarium light daily by your hands with the Finnex Planted+ 24/7 LED light because it is built with a controller which ensures everything is automatic. The controller is preset with a 24/7 automatic lighting cycle for hands-free operation. The 24/7 feature mimics the sunrise and sunset in nature which gives the aquarium an outdoor like condition. The 24/7 automatic lighting cycle begins with a cool lit dawn, which then transitions into a warm sunrise morning, to an intense color blazing high noon, to a red sun drowned sunset, and finishes with a starry night blue moonlight. The lighting cycle repeats itself in real time on the following day. The cycle is automatically directed by a built-in controller, thus eliminating the need of daily monitoring of the fixture. There are two 24/7 buttons on the remote control. The white is the default 24/7 lighting cycle with fixed colors that can’t be changed. The blue is for creating your own 24/7 lighting cycle with colors that are adjustable. The old version Finnex Planted+ 24/7 Fully Automated Aquarium LED doesn’t allow you to adjust the colors and intensities within the 24/7 lighting cycle. So the blue 24/7 button is a great addition of this new version Finnex Planted+ 24/7 v2. Both of two versions cost similar prices, so there is no reason to buy the old version. Programming the 24/7 color cycle is simple and straightforward due to the well-labeled buttons. First, press white 24/7 button to engage 24/7 mode. Then, press time button closest to present time. Finally, press white 24/7 button again to save and confirm your settings, and the fixture will automatically switch to the light at the time you set. You only need to set the correct time once and the timer will remember it, even after returning from other modes to 24/7 mode. Press blue 24/7 button to start it. Choose a time at which you want to adjust its lighting color. Using color control pad to achieve your desired color. Hold save button (containing red down arrow at the right of the blue 24/7 button) to save the color. Repeat steps 2-4 if you want to customize many time points. Press time button closest to present time. Press blue 24/7 button again to save the time and activate customized 24/7 lighting cycle. Apart from ensuring proper plant growth, the Finnex Planted+ 24/7 is also included with blue, green, red LEDs which offers various wonderful lighting effects for great enjoyment at day and night time. It comes with some ready-to-use preset modes if you don’t want to use the 24/7 preset mode. 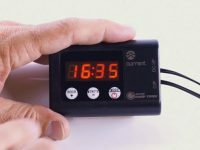 The equipped IR remote gives you the ability to induce various lighting and weather effects including blazing thunderstorm, cloudy days, sunny days, and moonlight effect. It’s a breeze task without any complication to use these lighting and weather modes. 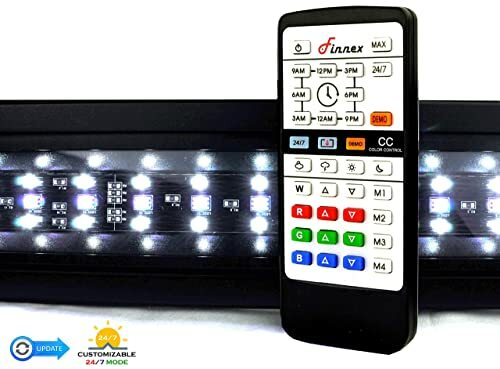 The lighting effect buttons on the remote control are labeled to the corresponding functions: cloudy, thunder, sunny and moon. Therefore, to engage your required mode, just press the corresponding button. Note: If you are using the 24/7 mode, weather modes, custom color buttons, and memory slot buttons will not function. You need to close the 24/7 mode by pressing the 24/7 button before setting these modes. Apart from the weather modes, you can create your own lighting effects and save them for later use. There are four memory buttons (M1, M2, M3, and M4) on the remote control for you to do that work. These memory slots are ideal for you to save numerous color combinations and light intensities. These functional buttons are ideal when you don’t want to use the 24/7 feature. The controller with remote control allows you to fully customize and store your preferred lighting colors. You can dim each of four color channels (blue, green, red, and white) to meet optimal colors that give your planted aquarium an attractive appearance. To save a preferred lighting color, only press one of the memory buttons. Then, to access the stored color, press the corresponding memory button and the last saved color will appear. The fixture is built with high quality aluminum which allows for ample cooling and superior heat dissipation. Water resistant splash guard provides it extended durability. There are various sizes available for choosing from 20 to 48 inches. Mounting the Finnex Planted+ 24/7 into your aquarium is smooth and takes minimal time with its unique leg fixture. 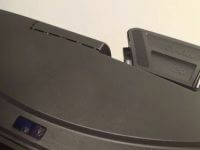 The legs can slide inwards, hence allowing flexible installation to various sized aquariums or sump setups. Moreover, the fixture legs have removable portions to ensure snug fitting to large aquarium rims. In conclusion, the Finnex Planted+ 24/7 LED is an all-in-one LED light in the market today. It is constructed from high-quality LED bulbs which ensure proper aquarium illumination. Apart from lighting up the aquarium, it provides enough light intensity for active aquarium plant growth. In addition, the programmable modes, dimmable lights, and memory functions render it an ideal light for planted aquariums. I recently purchased this light for my planted 20 gal tall tank and it has done WONDERS in assisting plant growth. I love it! However, it has done so well that I have recently started to develop some cyanobacteria. I understand that there are numerous ways to attack this issue, but if I were to begin with altering the lighting settings, what would be some suggestions of yours? I currently have it set up on the automatic 24/7 setting. Great product once again! Just curious about some suggestions.